If you’re in the final weeks of pregnancy, you’re likely getting anxious. Your feet are swollen, your back is sore, and you’re getting tired of the nonstop tour of public restrooms throughout Polk County. 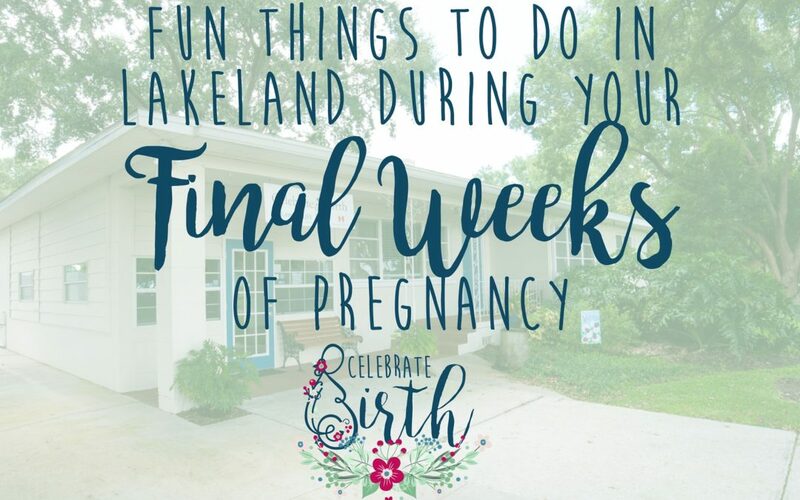 While it’s tempting to hop on the yoga ball and reach for the pineapple juice, use this time to take advantage of all Lakeland has to offer before the newest addition arrives! Barnett Family Park Splash Pad- During the warmer months, check out the Barnett Family Park! The entire park is shady and well-maintained and features areas for every member of the family. There are several playgrounds including one completely catered to preschool-aged children. And if the heat is wearing you down, there’s a fantastic splash pad to cool your family! Hollis Gardens- Walking during the final weeks is a great way to prepare your body for labor. If you’re looking for a way to shake up your daily hikes, try Hollis Gardens! This botanical garden sits on 1.2 acres of land and plays host to over 10,000 varieties of shrubs, flowers, and native trees. It’ll be the perfect change of scenery! Visit a Lake- The perfectly named Lakeland is home to a number of beautiful lakes. Lake Hollingsworth has one of the most popular trails in all of Florida with a 2.93 mile route wrapping around the lake. If you’re not up for that full walk, take a rest and feed the swans that call the area home. Similarly, pack some scrap veggies for the ducks at Lake Mirror and enjoy the gorgeous view of the Lakeland skyline. The area has some shady spots to relax as well as a bistro to catch a quick bite to eat! Explorations V Children’s Museum- Your family dynamic is about to shift dramatically, especially if this isn’t your first baby. Take this time to create some memories with your older children through a trip to the Explorations V Children’s Museum! The museum seeks to engage all five senses with younger kids. It’s made up of three floors dedicated to teaching music, science, art, and history through hands-on activities. Your whole family will enjoy the visit! Family Fun Center- The Family Fun Center is another way to pack in family fun! Challenge each other to a round of miniature golf or take turns playing arcade games. The center also offers a play area for younger kids as well as a laser tag arena (though we’re willing to bet you won’t be in the mood for that!). It’s the perfect place for a family night. Polk Museum of Art- The Polk Museum of Art hosts an impressive collection of over 2,500 pieces including works by Picasso, Andy Warhol, and Rembrandt. The museum passionately believes in educating the public and has pledged free admission to all visitors. If you’re still in the mood for walking afterwards, check out the Child of the Sun building collective less than a half mile away, also on the Florida Southern College campus. The visitor center offers seasonal, pre-planned tours, though you can take the walk yourself to see the largest collection of buildings commissioned by the late, great American architect, Frank Lloyd Wright. Silver Moon Drive-in Theater- Not in the mood to walk? Then check out the Silver Moon Drive-In Theater. The Silver Moon shows current double features on its two screens. It’s the perfect activity to distract you from the long waiting game. Whether you choose to camp out in lawn chairs or watch from the comfort of your car, you’ll love the nostalgia packed in this establishment. Downtown Lakeland Food Truck Rally- Having trouble deciding between Greek and Thai? Maybe barbeque and Cajun? Once a month in Munn Park, there’s the Lakeland Food Truck Rally to help you decide! Over twenty food trucks gather to offer a variety of meals and desserts to families (and their pups!). It’s a great way to satisfy any craving and enjoy the beautiful Florida fall season. Go shopping!- One thing many women don’t consider prior to giving birth is the loss of ease of ducking in and out of shops. If you’re in your final weeks of nesting, consider using this time to take full advantage of whatever mobility you have left! Lakeland has a great variety of specialty and antique shops including Scout & Tag, Vintage Warehouse, and the Stationary Loft & Gift Boutique. If you’re on the hunt for unique accessories for the nursery, check out these downtown shops. Go on a date to a restaurant!- Let’s be honest: date nights might get more complicated in the future. Prepare yourself by making it a priority now! Lakeland has a variety of wonderful restaurants. The Mediterranean food Cafe Zuppina offers is a tasty way to get in some helpful nutrients! If you’re in the mood for something a little fancier, Nineteen61 serves high-end Latin American food while Bay Street Bistro offers a combination of Italian, French, and American dishes. Our staff loves Tapatios for authentic Mexican cuisine and Cafe Roti’s delicious Indian fare. We know it’s been a long nine months. This is the perfect time to treat yourself to some great food. And finish up with something sweet!- Of course we advise you to eat healthy throughout pregnancy, but there’s no reason why you can’t enjoy yourself every now and then! Gelati Joe’s is one of the best spots in Lakeland to do just that. The shop offers Italian ice, dole whips, shakes, sundaes, and more. Plus, they use natural ingredients and fresh fruit to keep it a little lighter. And if you’re a fan of doughnuts, you have to try Hole in One Donuts! Theirs are big, fresh, and always delicious – and they have some of the best apple fritters in town! Make sure you feel totally prepared…- If you’re feeling a little bit overwhelmed by the last few weeks of pregnancy, come visit us over at the Nest. The Nest is a wonderful organization that offers classes on pregnancy, birth, and early parenting. You can schedule a consult with a doula to finalize your birth plan or meet with a breastfeeding specialist to provide a prenatal lactation consultation. You’ll leave here feeling confident for birth and all that follows! And make sure you feel totally relaxed!- One of the best things you can do in the final trimester is schedule a prenatal massage. At Celebrate Birth, we have an on-staff Licensed Massage Therapist who will help you feel at ease. Besides providing some wonderful relaxation, massage will assist with hormonal production and placental functioning and make you feel your absolute best. It’s the perfect way to kick back and enjoy the final weeks before the baby arrives! At Celebrate Birth, we want you to appreciate this time rather than feel anxious! If you’re still looking for ways to spend these weeks, let us know! From our licensed midwives to our well-stocked Lending Library, we want you to be completely ready for once the baby comes.